14.1 - Stalin's Legacy - Dissolution of the Family - "Don't Wait For Me"
Dissolution of the Family. 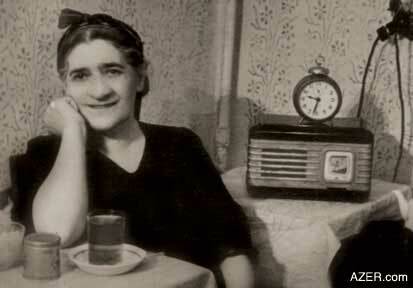 "Don't Wait for Me"
One of the saddest legacies of Stalin's policies was the dissolution of so many families. Across the expanse of the entire Soviet Union, millions of families were left broken and destroyed - even when prisoners managed to survive and return home. It seems no family was left untouched by Stalin's Repressions. Naila Hasanova, 69, tells the story of her parents - Samaya and Anvar - who enjoyed six difficult, but impassioned, years of marriage before World War II separated them. Anvar survived the war front although many Azerbaijanis didn't. But when he returned home, the trauma wasn't over. Soldiers who had been captured and interred in German prison camps were viewed as "Enemies of the People" by the Soviet regime because Stalin had ordered those in the military never to allow themselves to be captured. And so immediately after returning from the war, the soldiers who had been imprisoned were hauled off to Soviet hard labor prison camps - sometimes for many years. Stalin used this as a ploy to exploit his own citizens and use them as slave labor to develop the natural resources, especially in less developed regions of the country. That's what happened to Naila's father Anvar Hasanov. After serving three years in the war, he was sentenced to 10 years in a prison camp near the Arctic Circle. Fearing that he wouldn't survive, he wrote his young wife and encouraged her to remarry and save herself and the two children. Broken hearted, she followed his advice. Many women faced the same dilemma. But Anvar did survive the tortuous years of prison camp and he did return home, only to face the painful reality that, indeed, the true love of his life had remarried and, because of the circumstances, she had done exactly as he had told her to do - not wait for him. Her daughter Naila reflects here nearly 70 years later about the impact Stalin's repressions had on her family. My mother Samaya (1913-1962) was a chemist and my father Anvar (1913-1993) was an oil engineer. They both were born in the same year. Both attended the same high school and the same university, graduating from the Azerbaijan Oil Chemistry and Industry Institute (now Azerbaijan Oil Academy). My father graduated from the faculty of Oil Mine Engineering, and mother took her degree in Chemical Technology. Her dissertation was about the mysterious underground rivers that flowed beneath the city of Baku. So my parents fell in love and got married in 1935 although her parents felt that they were too young. They had a crazy love. In 1937 they gave a birth to a son Rufat, who died of measles. Then I was born in 1938, and two years later, my sister Elmira came along. My parents lived together for only six years. At that time, father was working for AzNeft [AzNeft: An oil company in Azerbaijan. The word "neft" means oil]. Actually, during World War II everyone in Azerbaijan who worked in the oil sector was exempt from serving in the military because Azerbaijan's oil played a major factor in countering the Germans [Azerbaijan contributed the majority of oil that was used in the Soviet effort to defeat the Germans. Azerbaijan deserves much credit for their incredible role in helping the Allies to gain the victory in World War II]. But my father had a sharp tongue. In one of the meetings, he started complaining about the Soviet system, perhaps in a joking manner. It was Stalin's era, and, of course, someone denounced him right away. People often would report on each other just to gain favor of those in high positions. Soon my father's exemption was removed and he was sent off to the war. This happened in 1942. I was four years old; Elmira was two. Father was sent to the Kerchi division in the Black Sea region of Crimea. It was quite a famous division and most of the soldiers were Azerbaijanis. But the Germans captured the entire unit. My father was sent to Osvenson and Dakhao labor camps in Germany as a prisoner of war. Father could have stayed on, found a job and lived in Germany as he knew the language. But he came back to Azerbaijan in 1945 for mother and us. Then came Article No. 50, which declared that all soldiers who had been prisoners of war in the enemy's land were considered "Enemies of the People" back home. Since my father had been held in German prison camps, that meant him and, predictably, they came and arrested him. Stalin insisted that soldiers should never allow themselves to be captured; they should kill themselves rather than be taken captive. But there were thousands of soldiers in the Kerchi camp and the entire camp was taken. How could so many people kill themselves? And why? I'll never forget the day when the NKVD agents [Azerbaijan contributed the majority of oil that was used in the Soviet effort to defeat the Germans. Azerbaijan deserves much credit for their incredible role in helping the Allies to gain the victory in World War II] came looking for father. It was December 19, 1945. My sister was only five years old but she also remembers it well. It was such a traumatic experience that we never forgot despite how young we were. The agents turned our house upside down. My sister and I were sitting on the couch. They came in and searched the whole house, ransacking the house and turning everything upside down. They couldn't find anything. We didn't even know what they were looking for - maybe guns, maybe letters from Germany. We never knew. .
We had a little suitcase, and they told father to put his stuff in it. Elmira asked: "Daddy, are you going to the bath house?" Left: Samaya, the granddaughter of Naila's sister, who was given the real name of her greatgrandmother. Finally, the family is choosing this name again. The last generation associated "Samaya" with too much pain brought on by Stalin's repressions. I was watching them with big wide curious eyes but I couldn't understand what they wanted from us. And then they took father away. Little did we know we would never see him again until 1956. 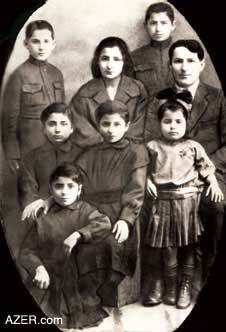 They kept father in Baku's Keshla prison until March 30, 1946. We used to take him parcels but were never allowed to see him or meet with him. 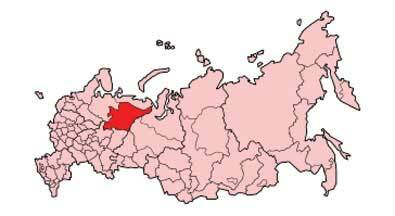 Official documents indicate that on April 24, 1946, the court sentenced him to exile at Vorkuta, a city on the Vorkuta River in the Autonomous Republic of Komi ASSR [The Komi Autonomous Soviet Socialist Republic was established in August 22 1921. It is located in northwest USSR close to Europe. The climate is quite severe. The average temperature in January varies from between ­15 to ­20C (5 to ­4F), in July, it ranges from 11 to 16C (52 to 61F). [Wikipedia: April 27, 2006]. In northwestern Russia close to Finland. Later he told us that they had had to walk much of the way to Vorkuta. It was called "etap", meaning "on foot". Of course, they went some distance by train, horseback and even dogsled, but they walked a considerable distance, too. Many prisoners died along the way. Father was clever; he managed to stay alive. He used to tell us stories of how they foraged for food to stay alive. They would eat raw potatoes, tree bark, leaves, grass, and roots of plants. Father was not allowed to write us. Article No. 58 denied permission to the Prisoners of War to correspond, but somehow he managed to send us two letters during those 10 years he was in exile. We received the first letter in 1948 while we were living in Shusha. He had passed it through various people, not the post office. I remember the day that it came as if it were only yesterday. I was 10 years old. My little sister and I were sitting together and mother read it to us. Father wrote that they were living under very bad conditions and that they had been told that they would have to stay there for the rest of their lives. He told mother not to wait for him and to marry someone else, and to create a good life for all of us. In the second letter that arrived three years later, father let my mom go free because he doubted that he would ever come back. He knew that we were suffering a lot because we had his last name. Again, he told her to try to make a good life for us, and to change her last name and ours. That letter was very painful for mother; it must have been the same for father. Our apartment in Baku was close to the sea. It was in a big, old house near Taghiyev's Musical Comedy Theater [Taghiyev's Musical Comedy Theater was rebuilt in 1998. It is located on Neftchilar Avenue not far from the Marionette Theater and Maiden's Tower]. One of the apartments on the first floor used to be ours, but the government took it from us and left us only with one room. Other people were assigned to live in the other rooms. What could mother do? And then the order came telling us to go to the NKVD office because they were gathering all the families of "Enemies of the People" so that they would leave the country for Kazakhstan. They gave us 24 hours. It was 1948. My mom had strong relatives. My mother's sisters were doctors and in a strong financial position. They gathered and decided that they must find a way so their sister would not be exiled from the country. They were so afraid that we would all die on that long harsh journey to Kazakhstan. Mother was a small, fragile woman. Stalin's Repressions devastated so many families and broke up so many marriages: (1) Anvar Hasanov (1913-1993), (2) Samaya Hasanova (1913-1962) who later married (3) Mustafa Mammadyarov. Anvar was Samaya's first husband and deep love throughout her life. They had two children before he went off to World War II. When he returned, Stalin sent him off to labor camp because his unit had been captured in Germany. The government policy required that the wives of such prisoners should also be sent into exile with the children. Mustafa Mammadyarov who had known Samaya since youth rescued the situation by marrying her and providing for her children. But then Anvar returned to discover that no family was waiting for him. Despite Samaya's love for her first husband, she did not return to him because of the kindness of her second husband through all the difficulties. Samaya's children are convinced that the stress of this situation is why she died of cancer at the young age of 49. Fortunately, she was quite attractive and men liked her. Many of them had been friends with her and my father since high school. Among them, there was one - Mustafa Mammadyarov - who loved mother very much. He knew the entire history of our family. He was divorced so he asked mother to marry him and promised to take care of us two girls. Actually he was the only one who promised to take care of us, her daughters. And he did his best, he really did. That way we could change our last name and not be exiled to Kazakhstan. Within the allotted 24 hours mother went and registered the marriage and officially changed her last name. They weren't actually married yet, but the agreement was official. The marriage took place later. "Father wrote that they were living under very bad conditions and that they had been told that they would have to stay there for the rest of their lives. He asked mother not to wait for him, but to make a good life for herself and us children." -­Naila Hasanova, describing the terrible dilemma that her mother face when her husband was sent into exile. Mother's relatives insisted that she do this. Her second husband Mustafa was also an oilman just like Anvar had been. Mother changed her last name, but we children kept ours. Now mother was no longer the wife of an "Enemy of the People", and we didn't have to deal with the problems that we had faced earlier. Father was trained as an oil engineer, but in Vorkuta where there was no oil, he worked in the coalmines. He became good friends with some of the German prisoners of war because he knew their language so well. The Administration of the camp used my father as an interpreter. In 1949-1950, they started returning German prisoners back to their country. Up until then, the Germans had labored all over the Soviet Union and constructed many of the buildings [Buildings that German prisoners built can still be seen in Baku, the most well-known of them is the Government House on Neftchilar Avenue near the Caspian]. My grandmother went to visit my father in the Arctic polar camp in Vorkuta, Komi. She was a real heroine. She gathered all the necessities she thought he might need, and took a train to Moscow. The journey from Baku to Vorkuta took her 18 days. I don't know what kind of transportation she used but she was determined to find her son and to make sure that he was still alive. After that, she returned to Baku. A year later, she went to visit him again. And then father came back home. The hardest part for mother was when he came back. Imagine her situation. She loved him so much but now she was married to someone else and had a child by this second husband who for years had so kindly protected her in this personal crisis. 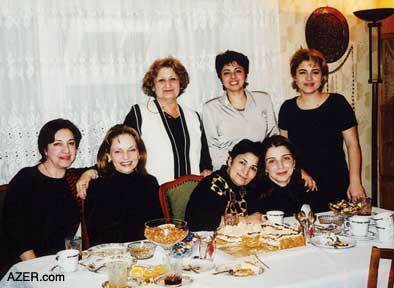 Above: Samaya Hasanova's descendents: (From left, sitting): Naila's half sister Zemfira (Mustafa's daughter), Zulfiyya (daughter-in-law of Elmira), Naila Hasanova who authored this article, Zemfira's daughter Sona. Standing (from left): Naila's sister Elmira, Naila's daughters: Nargiz and Samira. Right: Jamila (Naila's granddaughter). Photo: 2003. Psychologically, it was almost unbearable for her. Who can comprehend her pain? Who can understand her heartache? My sister and I analyzed the situation for many years after her death, and we think that she developed brain cancer because she had to deal with so much stress in her life. She really died at a very young age - 49 - in 1962, only six years after father returned. We saw father a lot after he returned. We used to spend time together. He used to see mother, too, but only at large gatherings such as weddings, funerals. They had common friends as they knew the same people and moved in the same circles. When mother died in 1962, father would go to the cemetery every day and place one flower - just one - on her grave. He did that for two years. We children wouldn't let her go back to father. We figured that we had grown up without a father and didn't want our younger sister to grow up without having a real father. We thought that our little sister should live with her real father. Though we were proud of that decision at the time, now that I look back on it, I think it probably wasn't the wisest thing. Mother suffered so much. She loved my father - her first husband - throughout her whole life. My father was deeply pained as well. He waited for mother to come back to him. He really believed that their love was so strong that she would do it. But then she became ill and died. Father remarried two years later, in 1964. When father came back from the war front in 1945, I was only seven years old. I didn't understand so many things at that time. But I was 18 by the time he returned from Siberia in 1956, and I could comprehend what was happening. After father returned home in 1956, like other prisoners of war, he was not allowed to live in any major city. They sent him to Ali Bayramli, about an hour and a half south of Baku. He worked in NGDU as head engineer. Fifty years ago, he was involved in the discovery of oil in Ali Bayramli. He continued to live there for two years (1956-1957). After that, he was allowed to settle back in Baku where he worked for AzNeft on the island of Peschani. After Khrushchev's death in 1964, the government started to send professionals to various foreign countries to work. Decisions were made in Moscow. They called father there and told him that they wanted to send him to India as an advisor on a major oil projects. So he went to India in 1969. "I always tell these stories to my grandchildren. I want them to know who their grandmother was. I want my children and grandchildren to be like her. 'You are the grandchildren of Samaya,' I tell them. This is the greatest legacy that she could ever have given us - the model of her life, even under incredible duress." He worked there for five years and helped to establish an offshore petroleum project for them. He even received a gold medal from Indira Ghandi acknowledging his work. Later, he worked in Czechoslovakia and received a Czech medal, too. After that, he worked in the Romanian oil sector. After mother died, we introduced father back into our family. This had been impossible prior to her death. After that, my stepfather and father became friends. They both had suffered the same grief when she died, but then they became very close friends. So many of Azerbaijan's smart, intelligent, talented people were wiped out. That's Stalin's legacy to us today more than 50 years after his death. Many of our most capable individuals died in camps, and even those who returned home after many years, usually did not live much longer. Look at mother who was left to have to cope with all of these things. She died from stress. I'm convinced that her cancer came from stress. In regard to Stalin, when I was growing up, a personality cult had developed around him. I attended a Soviet school where Stalin was like God. I was a kid and didn't realize that everything that my family had suffered was because of Stalin. In 1953, when Stalin died I was in the 7th grade. The entire class was sitting there, crying. I was crying, too. I didn't know that Stalin was responsible for all these repressions. 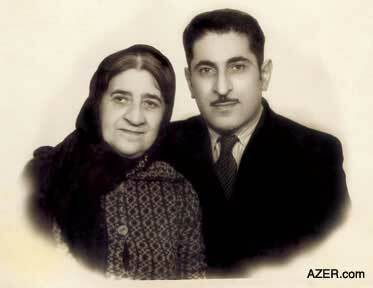 Above: Anvar with his mom in 1955, the second time she went to visit him in the prison camp. Twice she made journeys alone to the arctic labor camps to find her son Anvar. The trip took her 18 days. Naila calls her grandmother a "heroine". Imagine when Khrushchev announced at the 20th Congress in February 1956, three years after Stalin's death that Stalin had organized all these repressions. All of us were in shock. We couldn't believe it. We didn't know that Stalin was the one responsible for all our pain. We always thought that those who were arrested or killed during those years were real "Enemies of the People". At the 20th Congress Khrushchev exposed and condemned this personality cult. Every person in Azerbaijan has painful stories about the repressions. Unfortunately, there's not a single book where all these stories have been collected. Mehdi Husein was the only Azerbaijani writer who dared to write a novel about the repressions during the Soviet period. It was published in 1966, a year after he died. Its title is "Underground Rivers Flow To The Sea". It's really about my mother. My mother and Mehdi's wife Fatma had been friends from childhood. Mehdi Husein as editor of Azerbaijan Literary magazine first published "Underground Rivers" in chapter sections in 1964. Unfortunately, he did not live to see his book come out in book format. The following year when he was only 56 years old, he had a heart attack right in front of an assembly of the Writer's Union - when some of the outspoken figures attacked and sharply criticized him. Mehdi had intended the book to be published in Russian to have broader distribution. Amazingly, the novel did come out in 1966 in book format - one edition. [Solzhenitsyn had published "One Day in the Life of Ivan Denisovich" in 1962 but only with the authority of Khrushchev who was trying to strengthen his own position and undermine Stalin's. Solzhenitsyn's "Gulag Archipelago" appeared as a published book first in the West in 1970, having been smuggled out of the Soviet Union. It was extremely rare for a Soviet writer to dare to attack the Gulag system openly until Gorbachev's time in the mid-1980s.] "Underground Rivers Flow To The Sea" was the only novel ever published about exile in Azerbaijan during the Soviet period. The author named his protagonist Samira Aydin. In other words, though he didn't use my mother's name exactly, he retained her initials - SA - Samaya Aghayeva. 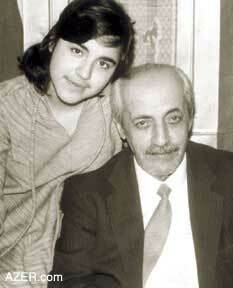 Left: Naila's daughter Samira with her grandfather Anvar. Samira was given the pseudonym that her grandmother is called in Mehdi Husein's novel "Underground Rivers Flow Into the Sea" by 1983. When my daughter was born, I named her Samira - Mehdi Husein's name for my mother. Neither my father or my stepfather would give me permission to call my daughter by mother's real name as it brought back such difficult memories, only reminding them that she was not with us anymore. But years passed and my sister did name her granddaughter Samaya after mother. We really wanted so much to keep the name of our mother in our family. Mother was such a great woman - intelligent, calm, and very kind. She had so many friends. Actually, when I was growing up, my mother treated me more like a girlfriend. We used to solve our problems together. Even when mother decided to get married overnight to save us from going to Kazakhstan, she talked to me about her dilemma, asking my opinion. I was only 11 years old at the time. My mother always trusted us. Trust is such a fundamental thing and I, in turn, trust my children.Mother always worked a lot. She held down two, three jobs. She became the Deputy Director of a chemical laboratory. Actually, she was the first chemist to earn her candidate of sciences degree. I learned many things from childhood. When I was five years old, I had to take care of my sister while my mother was at work. I would take my three-year-old sister to kindergarten, while I was going there myself. My mother was a small woman but she had a strong character. She did everything for us. Even today, we hold her up as model for us. Whatever major decision we have faced in life, we would always think whether it would make our mother happy or not. Even now when I do something, I always think whether my mother would approve of it or not. If this tragedy had not happened to our family, everything would have been so different now. My mother and father loved each other more than anything else. They had a deep friendship. Everyone knew my mother and father loved each other. They both were so talented. Our life would be happier. And the most important thing, I don't think that my mother would have died so young. I always tell these stories to my grandchildren. I want them to know who their grandmother was. We - the daughters of Samaya - always aspire to be like her. I want my children and grandchildren to be like her. I always tell them that whenever they think of doing something bad remember: "You are the grandchildren of Samaya." This is the greatest legacy that she could ever have given us - the model of her life, even under incredible duress. Naila Hasanova graduated from the Physics faculty of Baku State University and she teaches physics as a Senior Lecturer in the Physics Department of the Azerbaijan Oil Academy. Her daughter Nargiz Rizazadeh and sister Elmira also contributed to this article.